Omasta Landscaping relies on a fleet of wheel loaders from SDLG. Chris Omasta, vice president of Omasta Landscaping, said the company’s SDLG loaders were purchased for a multitude of reasons, including their versatility to handle a variety of jobs, value proposition and ease of maintenance. Omasta Landscaping, founded in 1979 is based in Hadley, Mass., and creates landscapes for homeowners, businesses and municipalities, including lawn installation, fertilization, irrigation and hardscapes, park renovations/construction and so much more. The company also specializes in snow removal during the winter months and relies on a fleet of wheel loaders from SDLG. Chris Omasta, vice president of Omasta Landscaping, said the company's SDLG loaders were purchased for a multitude of reasons, including their versatility to handle a variety of jobs, value proposition and ease of maintenance. Omasta also commented on the maneuverability of SDLG loaders, particularly as the company performs snow removal in areas with tight working quarters such as parking lots and city streets, for example. "The value proposition of SDLG is outstanding," Omasta said. "Because of the attractive price points, we were able to purchase two SDLG loaders. Essentially, we can now do twice as much work, boosting our efficiency and return on investment. They are great loaders that maneuver well for snow removal applications and have outstanding visibility. The factory installed back up cameras that come standard are also a huge plus." 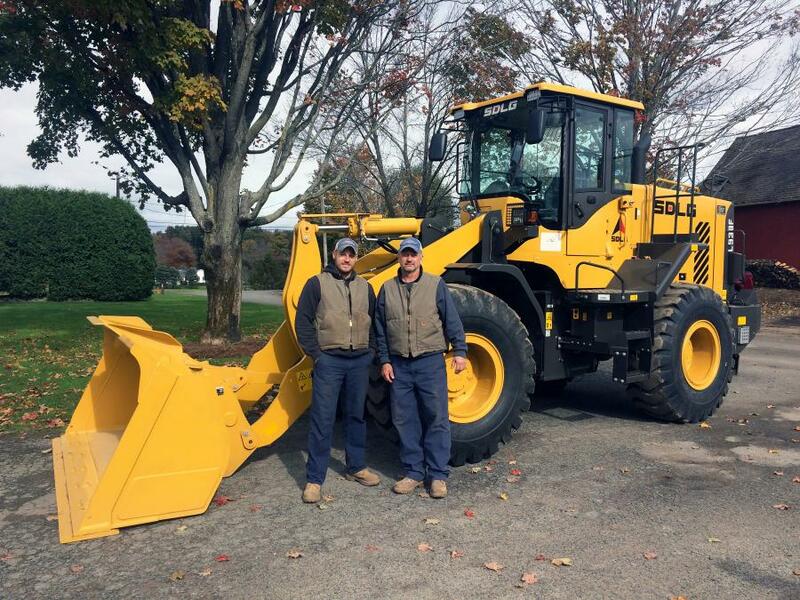 Omasta Landscaping's relationship with SDLG dealer Tyler Equipment, based in East Longmeadow, Mass., was crucial to the company's choice of wheel loader for its snow removal business. Together the two companies assessed Omasta's unique need for value loaders that were easy to maintain and operate, and considering they would mostly be used seasonally, could still provide a good return on investment. "We have a long relationship with Tyler Equipment and it has helped us update our fleet over the last three years," Omasta said. "With Tyler's guidance, we purchased two SDLG wheel loaders, the L918F and L938F, which we plan to use for snow removal, as well as general landscaping applications. Our salesman walked into our office with an SDLG catalog, final sales price on an invoice and local references and we decided to purchase our L918F right then and there." The L918F is a compact, 1.3 cu. yd. capacity loader that often competes with skid steers, offering a compact footprint with high maneuverability that doesn't damage job site grounds. The L938F is a mid-size front end loader with a 2.5 cu. yd. bucket capacity that is ideal for landscaping, residential building site prep, utility work and seasonal applications like snow removal. "So far, we're very pleased with our SDLG wheel loaders and would recommend them to any company that needs a value wheel loader that is backed by a great dealer network," Omasta said. "Tyler equipment gave us a great recommendation and the loaders are already working well in the field."